Once Upon a Time There Was No Such Thing as "Work"
Hunter-gatherers — both those who existed prior to agriculture and the few who’ve survived it — had/have no concept of work. Their “work” — the things they did that were necessary for survival — was so light they didn’t think of it as work. While anthropologists argue over whether the average workweek of the hunter-gatherer is 20 or 40 hours, evolutionary psychologist David Gray argues it was zero. 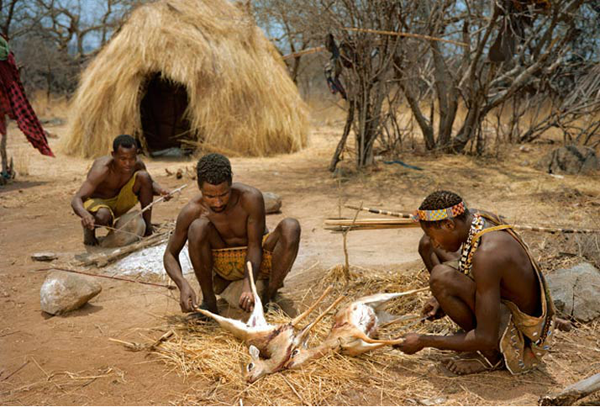 That’s because hunter-gatherers make no distinction between work and leisure, Gray says in his Psychology Today article Why Hunter-Gatherers’ Work is Play. Much of the debate revolves around how we define work. Some anthropologists count only the time spent gathering and hunting food, which is between two and four hours a day. Others include cooking, making tools and building shelter. Even if you include every possible activity that could be considered work, the highest estimates are no more than 40 hours a week. By the same standards, we could say members of modern civilization easily work 80 — at least 40 hours on the job, followed by another 40 hours of non-paid work such as commuting, shopping, cooking, cleaning, doing laundry, making repairs, paying bills, etc. But how many hours gatherer-hunters “worked” becomes irrelevant when you understand why primitive peoples think of their “work” as play. Is picking berries work or play? For migrant farm workers, who toil in the heat for 12-14 hours a day, it’s work. But for a little girl picking a basket full of berries in her grandma’s backyard — or on the African savannah — for an hour, it’s play. The same could be said about fishing. For commercial fishermen, it’s backbreaking work. For others, it’s a leisure activity. Hunter-gatherers do not have a concept of toil. They may learn a word for toil to refer to the work of their neighboring farmers, miners, or road construction workers, but they do not apply it to their own work. Their own work is simply an extension of children’s play. Children play at hunting, gathering, hut construction, tool making, meal preparations, defense against predators, birthing, infant care, healing, negotiation, and so on; and gradually, as their play become increasingly skilled, the activities become productive. The play becomes work, but it does not cease being play. They do not work according to the clock [they don’t have clocks or keep track of time] … There is ample time for leisure activities, including games, playful religious ceremonies, making and playing musical instruments, singing, dancing, traveling to other bands to visit friends and relatives, gossiping, and just lying around and relaxing. The life of the typical hunter-gatherer looks a lot like your life and mine when we are on vacation at a camp with friends. Most of their work is done cooperatively, and even that which is done individually is done in social settings, with others around. And–because hunter-gatherers are highly mobile people, who move to another band if they don’t like the people they are currently living with–their bands are truly friendship groups. In general, anything that we humans do with friends has more of a spirit of play than things we do alone or with collaborators who aren’t really friends. 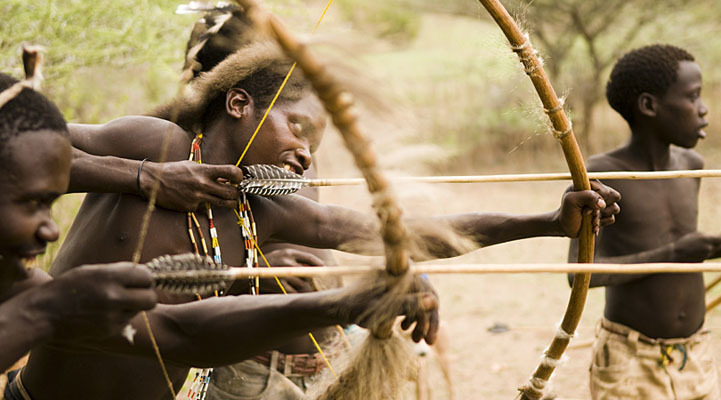 Clearly, in an ultimate sense, hunter-gatherers’ work is not optional … However, for any given person, on any given day, these [activities] for the most part are optional … Hunter-gatherers everywhere maintain an extraordinary ethic of personal autonomy … They deliberately avoid telling each other how to behave … Each person is his or her own boss. On any given day, a band member may join a foraging group, visit friends in another camp, or just stay in camp and relax… Such freedom does open up the possibility of free-riding … but such long-term shirking apparently happens rarely if at all. It is exciting to go out hunting or gathering with the others, and it would be boring to stay in camp day after day. Even the most industrious hunters and gatherers receive no more food than anyone else, Gray says. Gray says as long as people are free and treated well, the great majority will gladly voluntarily contribute to the well-being of the whole tribe. Life is what you make it. It’s sad that more time is spent trying to make a better life through monetary gain than by spending time with family or just enjoying the simple things in life. I Liked your article “Haunting Photos of Hermits in the Woods Highlight Crisis of Civilization”, but I LOVE this article. I cant say any other kind of belief hits home for me more than what was said in this article. It seems like every day at work im asking myself “what the heck am I doing?!”. I work so that I can be here tomorrow or next week, or maybe have a retirement so I can sit and do nothing when my body is barely moving? This whole culture makes no sense and it TICKS ME OFF that seemingly no one thinks about this…. that seemingly no one is breaking out of society or that large droves of people aren’t just packing up a few things and leaving the rat race. Thanks for writing and bringing this awesome content to other peoples’ eyes Sara Burrows. Well said. I think about this, too, everyday. I look at our modern way of life and it makes me feel crazy! 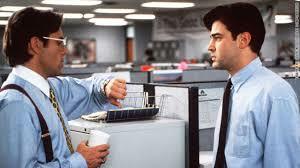 Pingback: Man Calls Work "Unnatural" - Goes on Permanent "Vacation"
I do get tired of modern life sometimes myself. They way they lived sounds interesting. If Gray had lived as a “Hunter-Gatherer” then the article “Hunter-Gathers’ Work Is Play” would never have been written. More worthwhile reading is “Socialism – The Fatal Conceit” by F.A. Hayek. Hayek deals with the noble savage hunter gatherers and explains the evolution of human society in the first couple of pages. If you don’t get it by page 2 then you are a Libtard for life.